around the world in 6 hours. I’ve mentioned before that whenever I travel I love to splurge on a guided tour. Usually it’s well worth the money (although our experience on the Isle of Skye was definitely an exception). 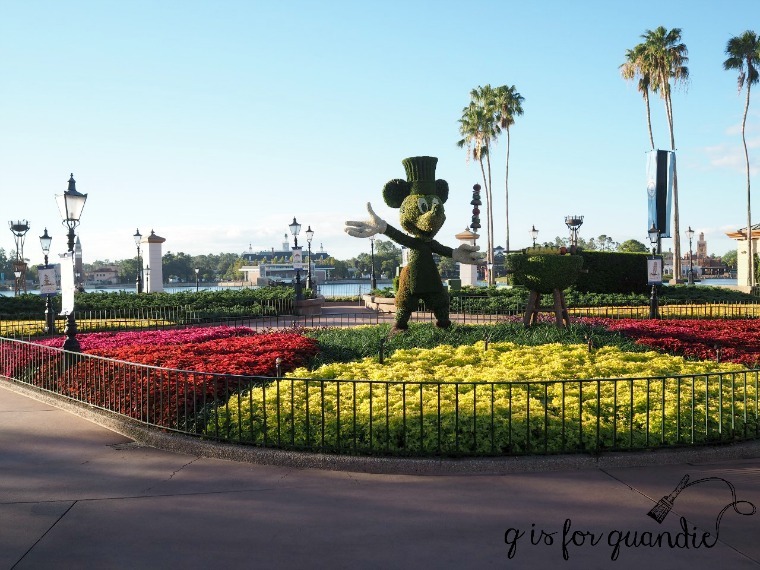 Disney, however, is no exception and we’ve done several amazing guided tours at both Disneyland and Disney World. I know it seems crazy to have already paid over $100 for a park ticket and then have to come up with another $109 for a guided tour. But since I was only paying for one and not for a family of 4, it was more do-able. And it was so worth the extra money! 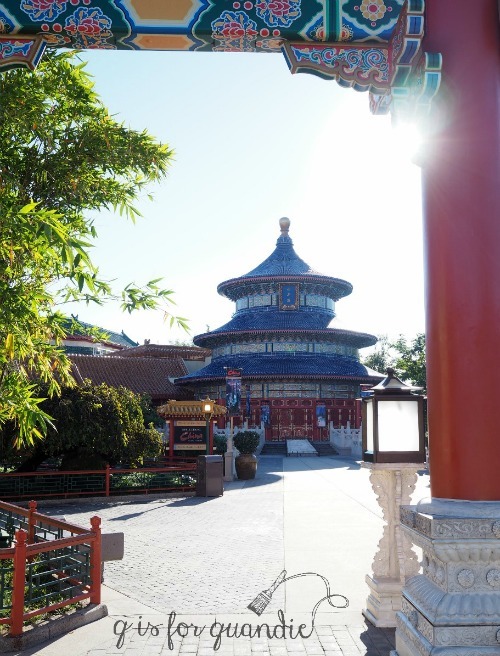 The World Showcase: DestiNations Discovered tour is a fascinating 5-hour walking excursion through 11 “countries” and 4,000 years of history, culture and food. 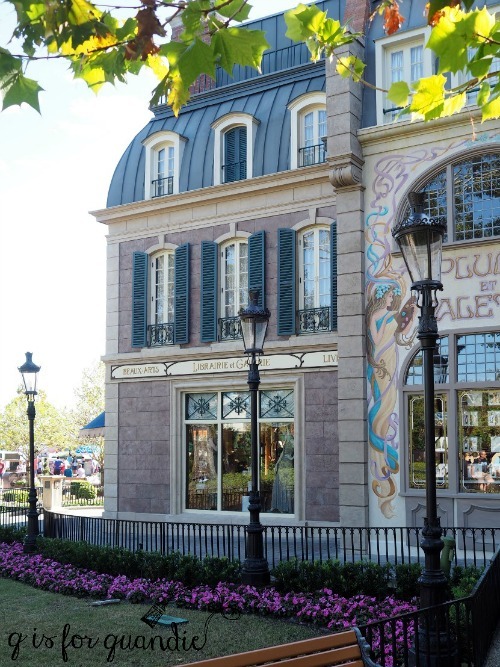 From the streets of Paris to the Bavarian countryside, Guests can immerse themselves in the architecture, landscapes, streetscapes, attractions, shops and restaurants of 11 themed pavilions. Before we get started on our tour around the world, I want you to check out the photo (above) that I took just before our tour started. Can you tell what’s missing? Here’s a hint, they stop in the middle of walkways to take photos, they run their strollers right over your feet, and they eat 5 million hot dogs every year in Disney World … yep, it’s people! Thousands and thousands of people. The crowds at Disney World are simply mind boggling. 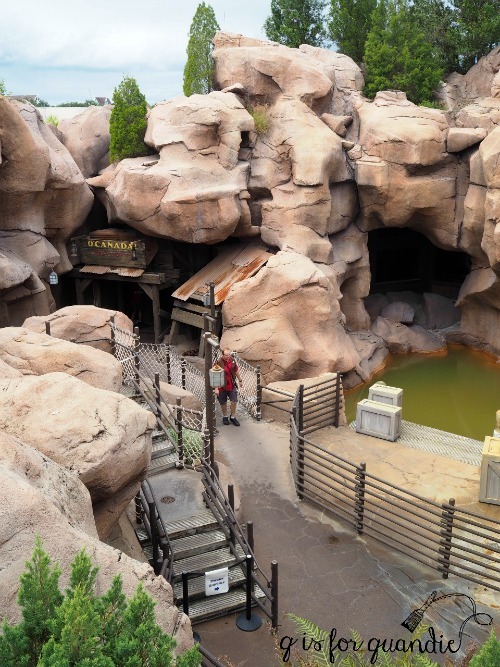 Disney doesn’t publish any actual attendance figures by day, by park, so I really can’t give you an official stat on this, but let’s just say the crowds can be a tad overwhelming. So one of the biggest benefits you’ll get by taking this tour is the opportunity to see a park without the crowds. The World Showcase in Epcot opens to the public at 11 a.m., but we started our tour at 8:30 a.m. That’s 2 1/2 glorious crowd free hours! There were about 12 of us on our tour, plus of course there were workers scattered about here and there, but otherwise we had the whole place to ourselves! Let’s get started on our world tour, shall we? We started in Mexico. 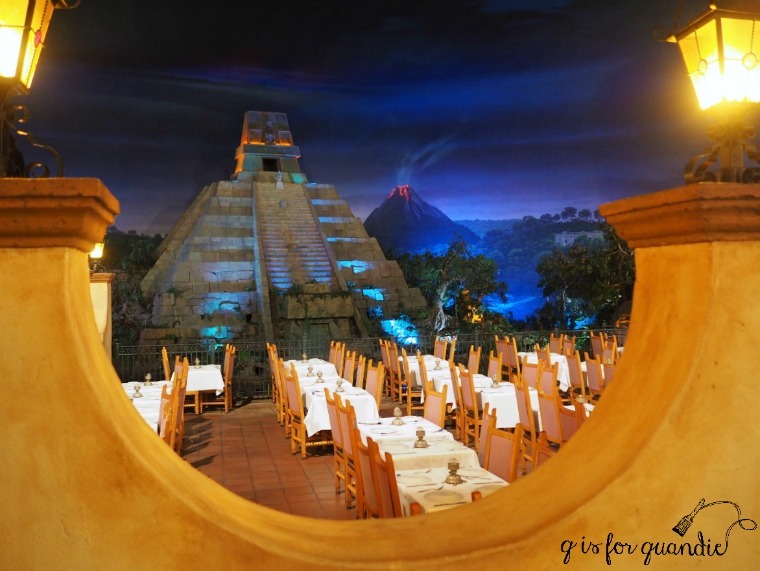 Inside Mexico’s pyramid you’ll find the most charming restaurant. I find Disney’s ability to recreate the atmosphere of a romantic dinner on a patio under the stars amazing. Usually this place is bustling and I miss most of the details, but it was easy to get a good look at things while we had it to ourselves. 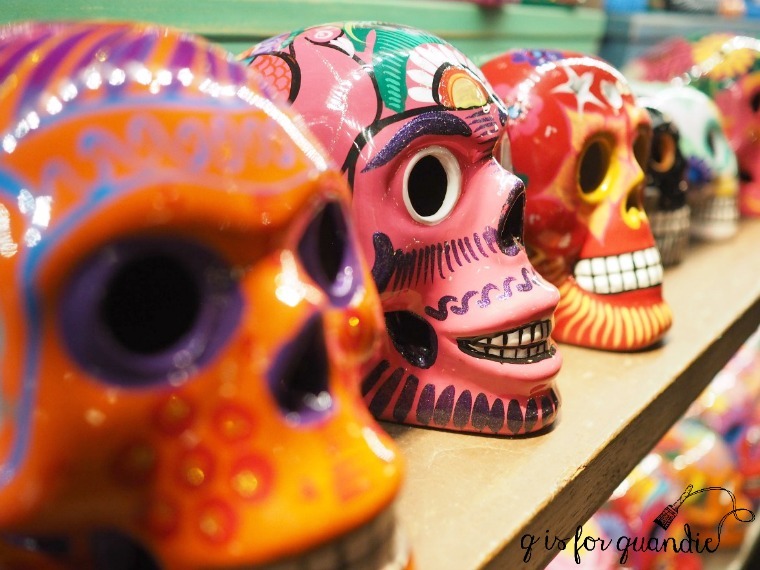 There is also a little marketplace inside, just in case you need some souvenirs from your trip to Mexico! Next up, Norway! After my trip to Norway last May, it was fun to compare the real Norway to the Disney version. 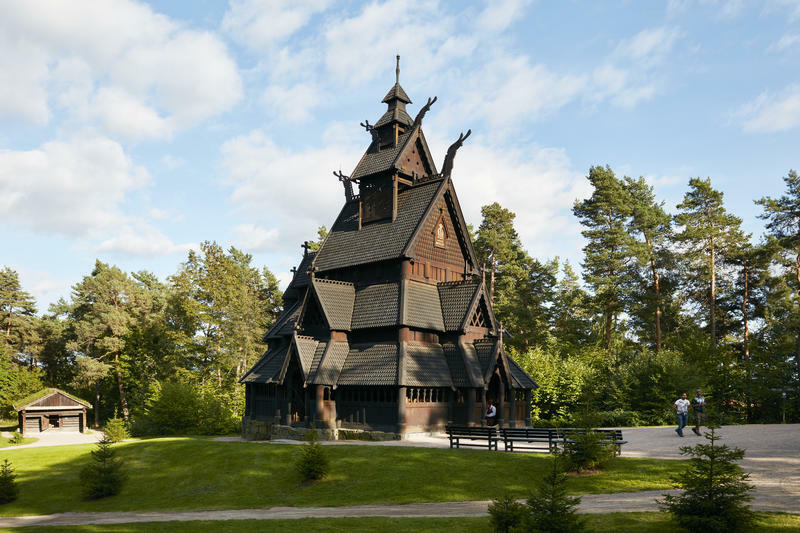 I saw the real Gol stave church in the open air museum in Oslo and the stave church in Epcot is supposedly a 4/5 scale replica of that same church. Can you tell the difference? Yeah, OK, the real one doesn’t have a sign advertising Disney’s Frozen movie on it. Plus I’m not really buying the 4/5 scale thing. I feel like the real one was quite a bit larger then the fake. 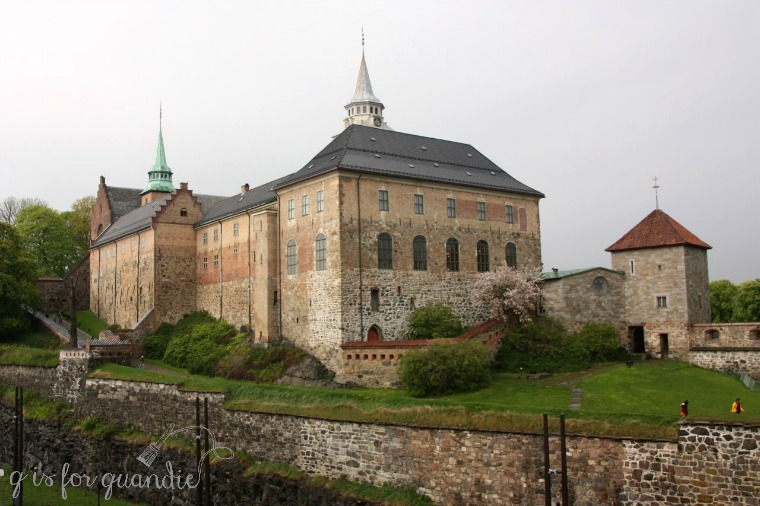 Do you remember the Akershus fortress from my May trip? They have a version of it in Epcot as well. Unfortunately our guide proceeded to tell everyone that Norway’s royal family lives in Akershus Fortress. I didn’t want to embarrass him by pointing out that their official residence is actually the Royal Palace. Minor detail, right? 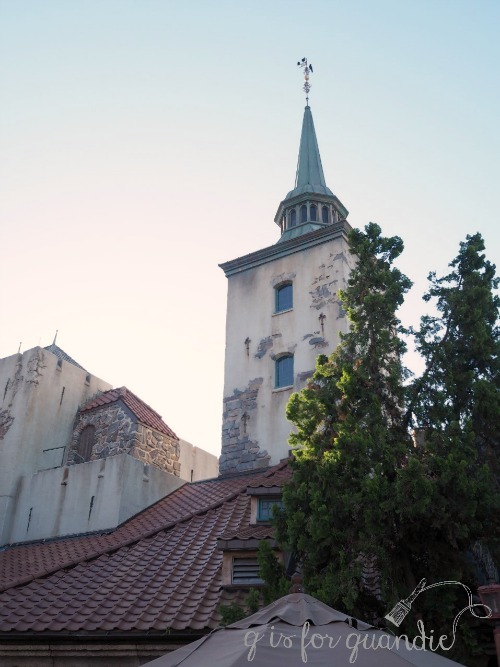 The Norway pavilion at Epcot has been ‘Frozen’d up’. 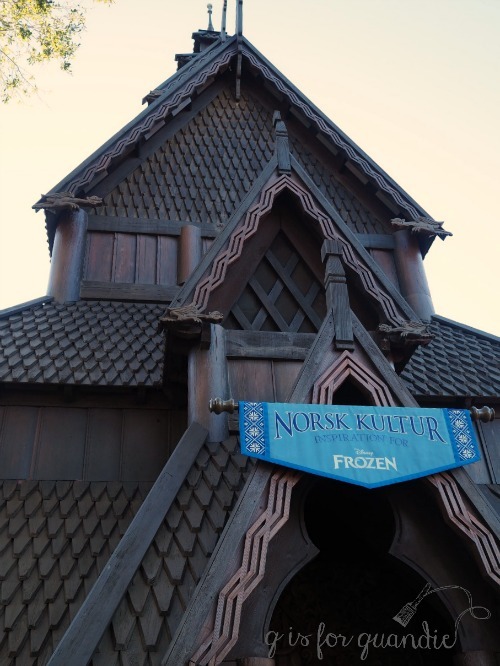 The ride that used to be about Norwegian culture now is the Frozen ride. The inside of the stave church contains traditional Norwegian items with signs about how they relate to the Frozen movie. Well, you can’t blame Disney. They are going to ride those Frozen coat tails for a long time, and they are trying anything they can think of to make kids enjoy the World Showcase. So let’s all sing a little “let it go, let it go” in our heads and move on to China! 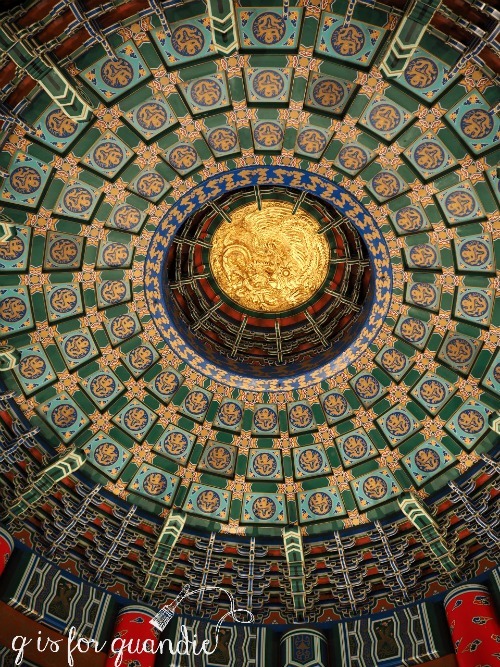 One interesting factoid that we learned in the China pavilion is that while all of that amazing detail on real Chinese temples is painted on wood, the Epcot version is all done with stickers. Apparently the humid weather of Florida was not good for painted wood. Now when the stickers start to fade or peel, they just slap a new sticker on. Now we take a big leap from China to Germany. 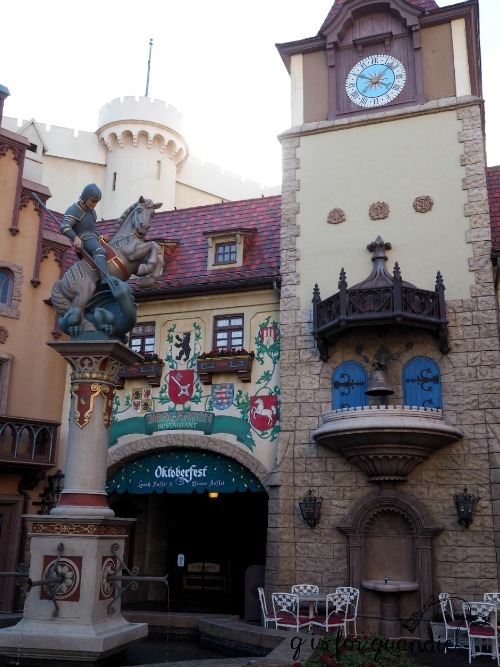 The Germany pavilion is very charming and it did remind me a little of our trip to Germany several years ago. I think Disney has punched up the volume just a bit though. The colors are a little brighter and more cartoon-ish. 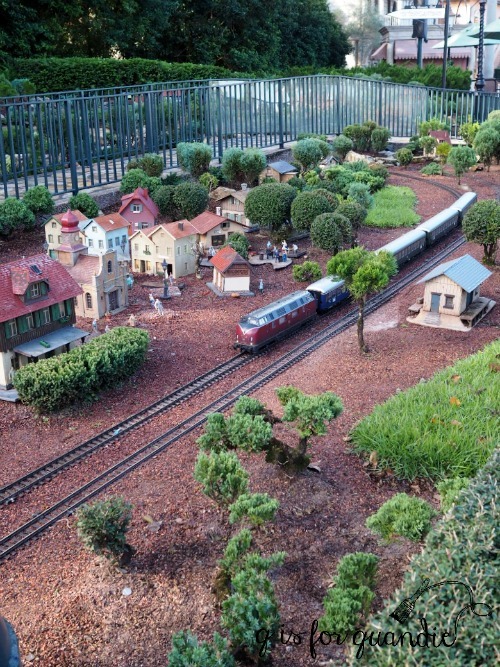 It was interesting to learn that the trains are on loan from a local model train club and they change them out weekly. 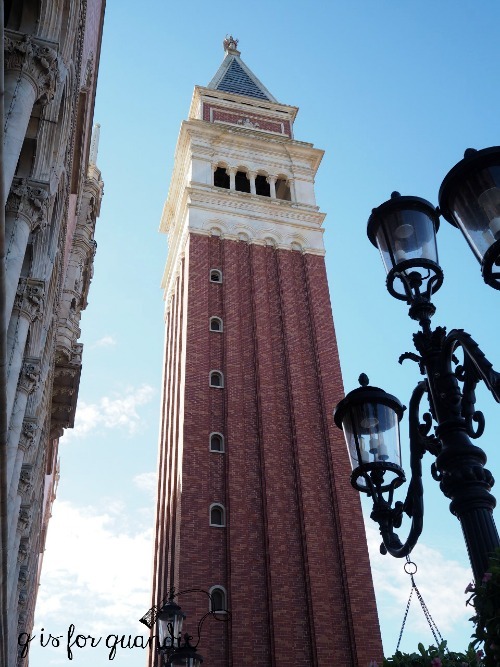 Since Venice is one of my favorite cities, I am always drawn in by the fake St. Mark’s Campanile and Doge’s Palace at Epcot. 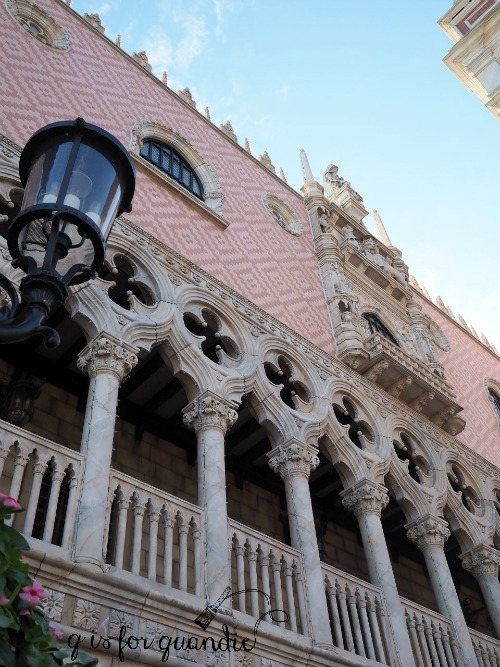 In this next photo take a look at how oddly short the pillars on the right hand side seem on the street level of the Doge’s Palace. Disney did that on purpose to give the illusion that the city is sinking, much like the real Venice. 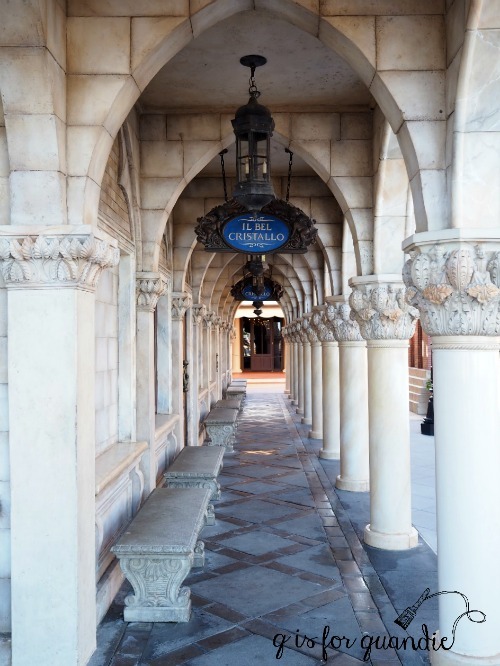 I have to say, seeing the real Doge’s Palace this devoid of people is even less likely than an empty Disney park! 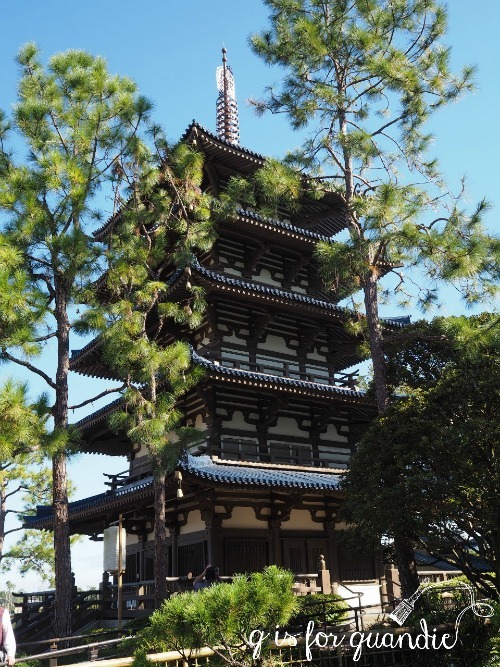 The American pavilion was purposely placed right in the middle of the World Showcase. 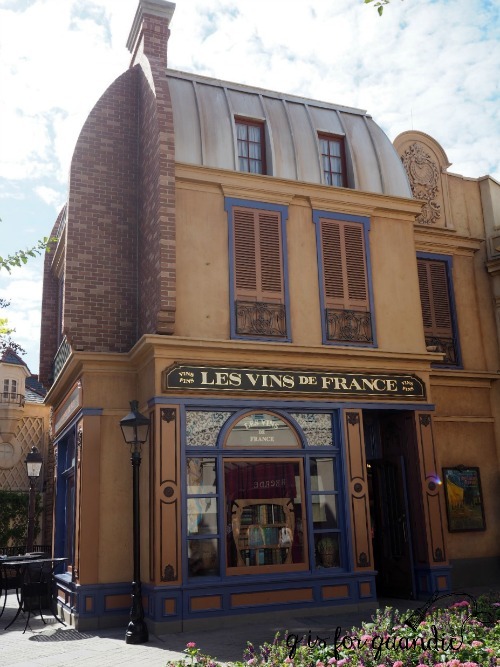 This is one of the very few Disney buildings that was designed to appear smaller than it really is. With most Disney structures it’s just the opposite and they are meant to appear larger than they really are. Japan is lovely, but unfortunately I was too busy admiring the garden which meant I didn’t pay attention to our tour guide at all so I have no insider secrets about Japan aside from the fact that apparently there is an eagle nearby that keeps eating all of the koi in the pond. 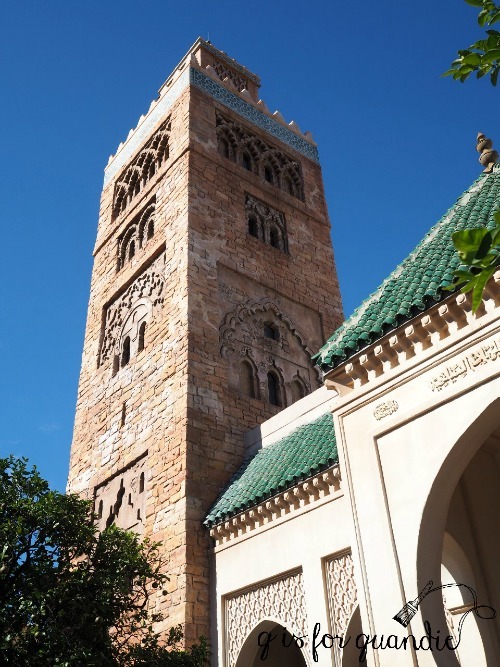 I started paying attention again in Morocco and I thought it was interesting to learn that this is the only pavilion in the World Showcase that was not sponsored by a corporation but instead was funded by the King of Morocco who also sent his own official artisans to Orlando to help build it. 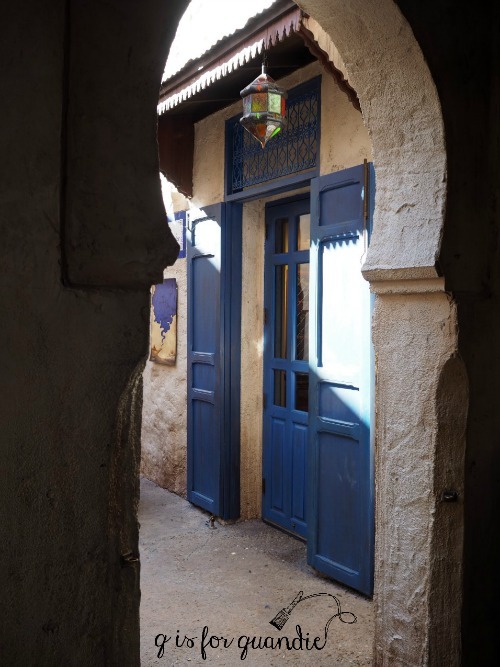 This pavilion definitely reminds me of my trip to Tangier with Mr. Q. 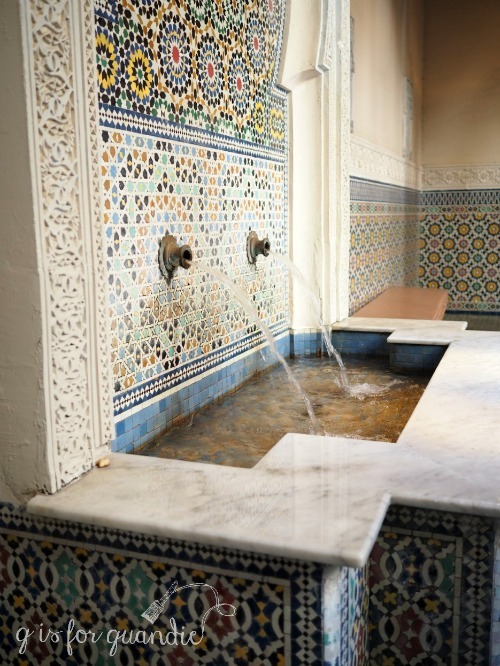 Especially the tile work, which is very typical of Morocco. By the time we got to France the park was open to the public and things started to get a little more crowded. I just love the style of these Parisienne buildings. And it just wouldn’t be Paris without the Eiffel Tower, would it? Our tour included lunch at the Rose and Crown pub in England. Our guide explained that they chose that name for the pub by compiling a list of the most popular words included in pub names throughout the UK and the words ‘rose’ and ‘crown’ were the top two. Funny sidebar. We were served Scotch Eggs as the appetizer for our lunch, a traditional Scottish food. If any of you remember the sad story of my tour on the Isle of Skye last May, you may remember that on that tour we were served tomato soup and egg salad sandwiches that were billed as the ‘best of Scottish cuisine’. Apparently I should have just gone to Orlando to get some authentic Scottish food! And in case you are wondering, the Scotch Eggs were delicious and so were the Bangers & Mash that I had as my main course, but the absolute best was the Sticky Toffee Pudding that was served for dessert. Delish! 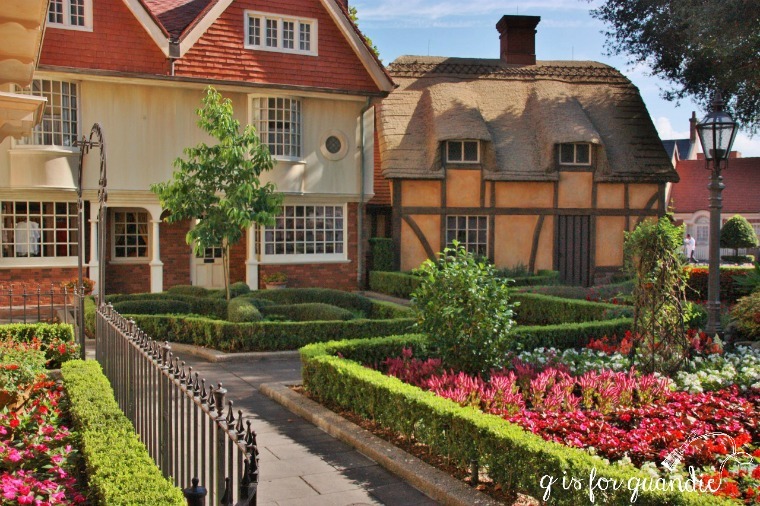 And here’s a little insider info on the thatched cottage on the right. 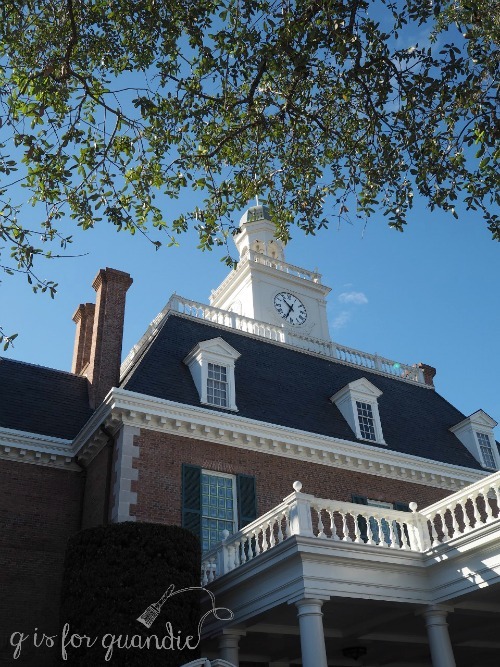 Apparently when it was first built they used real thatch only to discover that thatch and Florida do not go together, so now it’s fake plastic thatch instead. I feel like the Canada pavilion has the most diverse collection of features ranging from totem poles to a French gothic ‘hotel’. 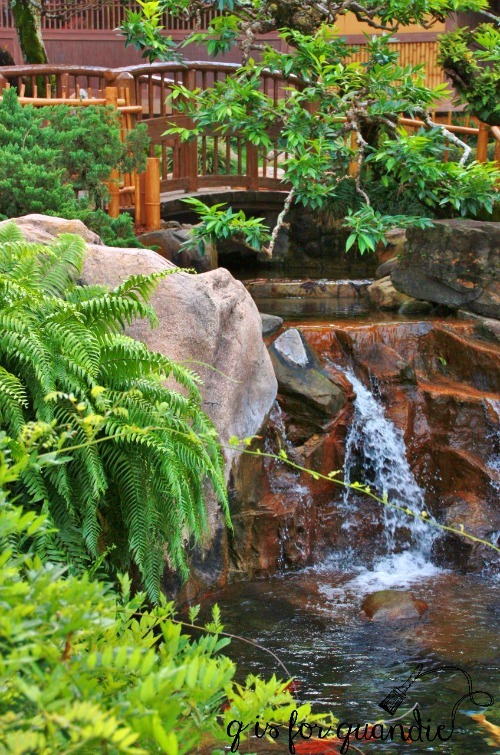 The famous Butchart Gardens are also represented, as well as the Canadian Rockies. Our guide brought us behind the scenes in a few spots on our tour including here in Canada. We went behind “the Rockies” to see that all of the trees are actually planted in big tubs so that they can be changed out easily when they get too big. Large trees would totally throw off the illusion of scale. And of course all of the rock is fake and from behind they are just hollow forms. Picture taking was strictly forbidden ‘back stage’ though, so no worries about spoiling the magic. As a special treat to end our tour, our guide brought us the back way to Soarin’ Around the World where he lead us to the front of the line and we were able to take the ride. All in all, it was truly an incredible tour and I would do it again in a heartbeat. So if any of you have a trip to DisneyWorld planned I encourage you to consider a tour. Or maybe you’ve already been on one, if so I’d love to hear about it in the comments! Next a pretty in pink Christmas. Wow! Love ❤️ Thanks for the great tour! I had no idea you could have a tour in Disney. Learn something new every single day…lol. And get to tour Disney without leaving the comfort of my own home. Thanks! Love all the pictures and facts. I think it’s a great idea to pay for the tour! I went to Epcot but with the crowds and a 5 year old , I didn’t get the same experience. Thanks for the little guided tour and the extra photos of the Canadian Pavillion. 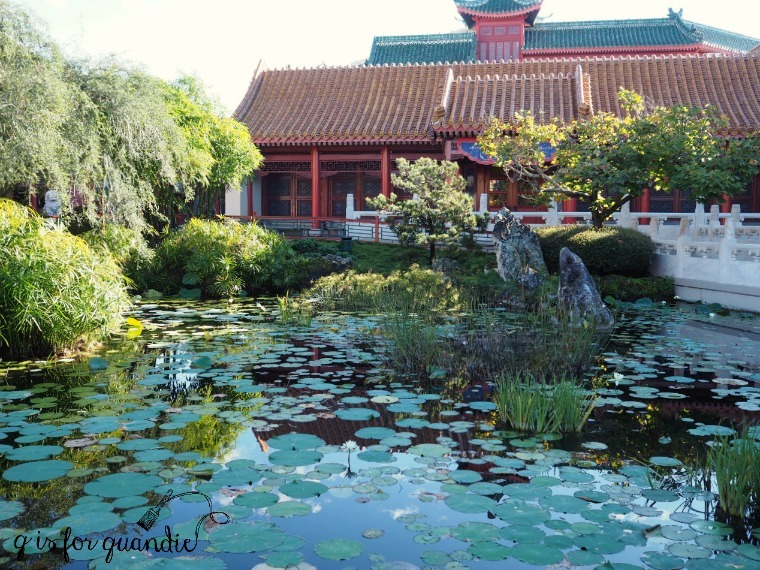 Years ago, at World Fairs, countries used to build pavilions to give attendies a taste of their culture. I remember going to Expo 67 in Montrea,l but I don’t think there has been world fairs since. Disney has provided a permanent exhibit. 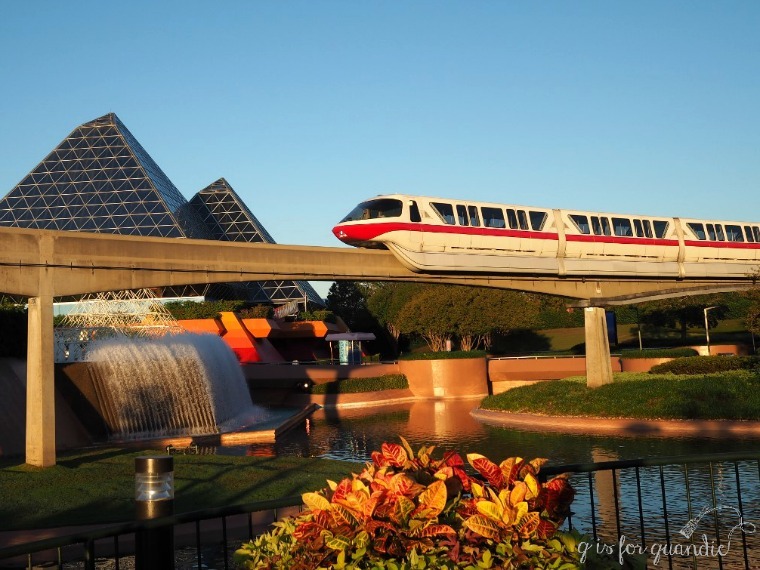 Your post has renewed an interest in going to Epcot. 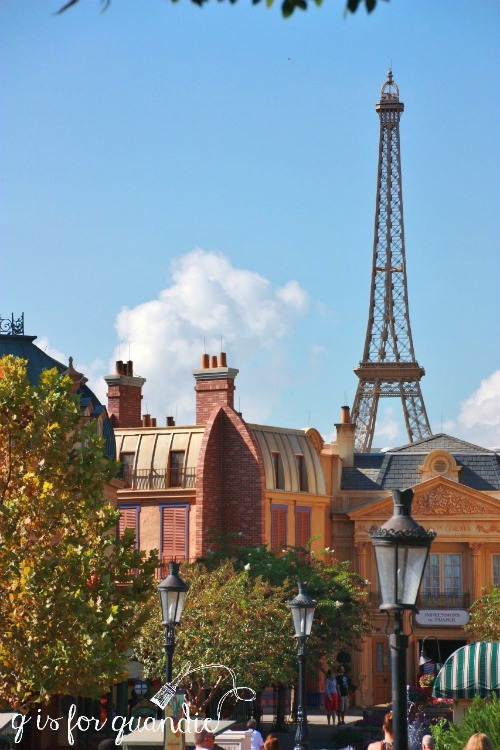 Walt Disney was very inspired by World Fairs and I’m sure that was the impetus behind his World Showcase, although he passed away before Epcot was ever built. The Canada pavilion is really beautiful, there is a 360 degree movie about Canada that you can see as well that is narrated by Martin Short. I would imagine that most 5 year old’s are going to be totally bored by the World Showcase (except for that Frozen ride now! ), and in fact the tour was limited to people over the age of 14 for that reason. But if you ever get the opportunity to go, I highly recommend it! Truly amazing! The details are unreal. Disney really goes above and beyond. You’re right, I think my boys would rather do the theme park, but this is definitely more up my alley 🙂 Thanks for the inside scoop! Disney really does do an incredible job with the details. I’m planning to do just one more post from our Disney trip about their Animal Kingdom park which also has some amazing details! Had no idea Disney offered guided tours. Beautiful pictures. Thanks for the info. Great tour! Thank you. I haven’t been to Disney World in years. Probably 30 yrs. Your tour makes me want to take a trip there again. Thanks. This was so fun to read! We are DVC members and I’ve yet to do a tour! This one might be too long for our 8 year old but I’m going to look into others! We are going next in February! You should definitely do one! And Disney has already anticipated that this particular tour is too boring for your 8 year old because there is a minimum age requirement of 14. But check out some of their other tours! Fantastic. I too had no idea there were tours. Thank you for sharing. I was confused by the Canadian Rockies photo. I live next door to them and they are more green with snow capped peaks. 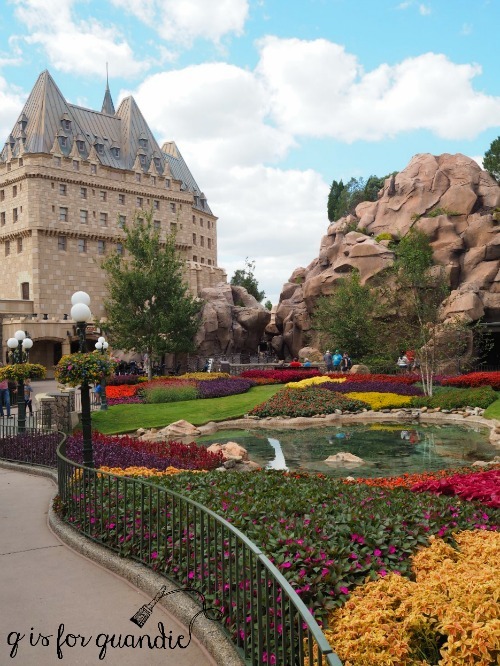 The hotel in Quebec City and Buchart Gardens were instantly recognizable. LOL, so what you’re saying is that Disney didn’t do a very good job with the fake Rockies huh? I wonder why they didn’t give them some snow capped peaks? They certainly were able to pull that off with the Expedition Everest ride in Animal Kingdom and the Matterhorn at Disneyland! It was a great tour and sure am glad we did this one. Plus our guide had 28 years of experience with Disney. I totally forgot to mention that. He was really an awesome tour guide!